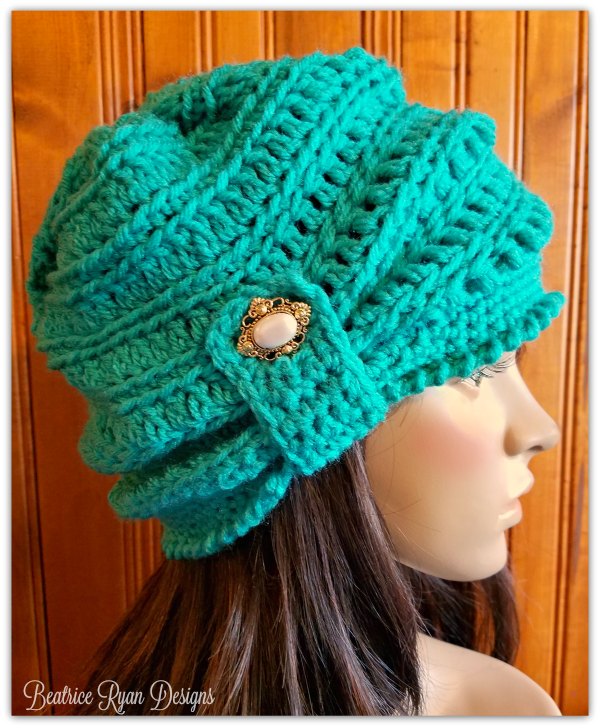 Wildwood Waves Hat… Free Crochet Pattern! Whether you are hiking in the mountains, out playing in the snow or sitting by the campfire… This plush and cozy Wildwood Waves Hat is the perfect accessory! It is super easy to make with a two row repeat, uses bulky yarn and is a weekend project! Please Favorite this pattern in your Ravelry queue!!! Click Here…. Yarn ~ Red Heart Hygge(Hoo-gah) yarn in A. Sterling and B. Cloud. #5 bulky yarn. This is a soft slightly fuzzy yarn that is so plush you will love it! 132 yards per skein. Beginning Cluster: Ch 2, Yo, insert hook in designated st or sp, pull up loop, yo, draw through 3 loops, ch 1, Yo, insert in st or sp, pull up loop, Yo, draw through 2 loops, yo, insert in st or sp, pull up loop, Yo, draw through 3 loops, Yo, draw through 2 loops. Round 15: Sl st in next ch 1 sp of cl, beginning cl in same space, cl in each ch 1 sp around, join to the top of beginning cl. = 13 cl Finish off leaving 8″ tail for closing top of hat. Weave tail in and out of each ch 1 sp, draw closed and secure. Attach Pom Pom to top if you like the look of it! Congratulations.. You now have a Wildwood Waves Hat!! Boreal Bun Hat… Free Crochet Pattern! Add this Free Crochet Pattern to your Ravelry favorites for easy access… Click Here!! Super simple messy bun hat!! The Boreal Bun Hat uses simple stitching and self stripping Boreal yarn by Premier Yarns to make this a quick and easy project… Do you need to get out the door quickly?? Just pull your hair up through the top and whip it into a messy bun… Quick, Simple and you are out the door looking fashionable this season!! *Shell – 3 dc in designated st. Round 1: 52 foundation sc (or ch 53, turn sc in 2nd ch from hook and each across), join with sl st to beginning sc being very careful not to twist the project = 52 sc. *The foundation sc is a bit more stretchy and will make a better base. *Attaching hairband – Ch 1, sc around the hairband into each st around, join with sl st to beginning sc. Congratulations, you now have a Boreal Bun Hat!!! Wintertide Beanie… Free Crochet Pattern!! If you love this Wintertide Beanie… Save it to your Ravelry Favorites… Click Here!! To celebrate the last day of Winter… Here is a brand new free crochet pattern~Wintertide Beanie! If you loved the Wintertide Headband… This beanie is just as easy!! I hope you love this just as much!! Chain 60, join with sl to form ring. Be very careful not to twist chain. Finish off leaving a long tail to draw top of beanie together. With right side facing, join yarn with sl st to bottom edge of beanie. Round 6: Ch 1, rev sc around, join with sl st to beginning. Attach button on wrong side of tab at the opposite end of the button-hole(ch 2 sp). Gathering hat and placement of the tab ~ From the inside of the hat, push button to the right side of beanie between 2 dc in round 8, bring the button-hole end around the brim of the beanie and button the tab closed. You can make the hat less or more gathered by placing the button in any dc round. Congratulations, you have finished your Wintertide Beanie!! !